After a year and change of rumormongering about the next iPhone or iPhones it has all been regurgitated to the point that only people not reading any tech blogs, or tech sections of traditional media, in short - not following the field at all - might be amazed when Tim Cook gets on stage tomorrow and announces something with a dual-core silicon, upgraded camera and maybe larger screen and thinner shell. The kicker, however, for us following the mobile scene daily, is how will Apple handle such a major announcement without the iconic presence of Steve Jobs. Apple moved the show to its hometurf at the Cupertino campus, the closest thing to making it directly from Tim Cook's house and completely avoiding stage fever. 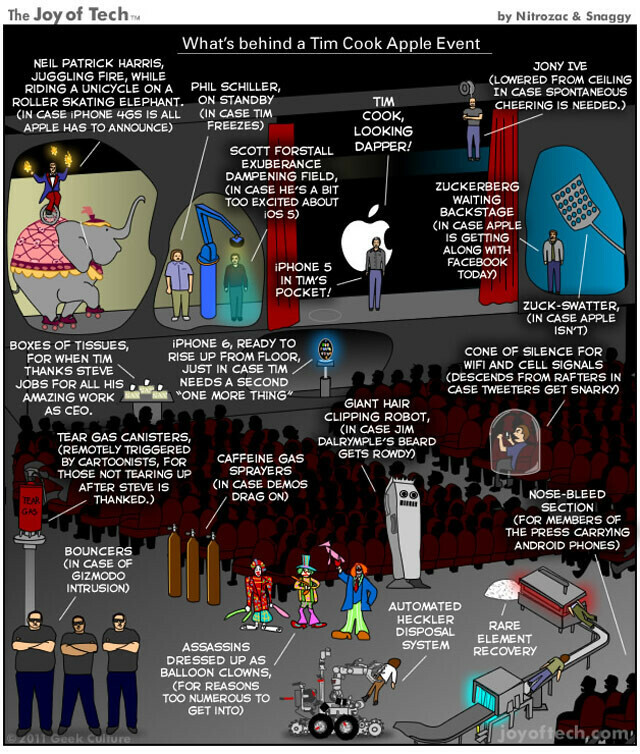 For a humorous take on how such a unorthodox event might be carried out by Apple's marketing department we present you a Joy of Tech cartoon. It's not the first time the guys there are making laugh-inducing drawings, but this one seems to hit the nail right on the head what might be going on currently on Apple's campus. 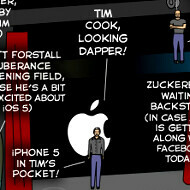 We especially like the nosebleeders reserved for any tech journos who are carrying Androids in their pockets. Hahaha. Neil Patrick Harris on a roller skating elephant. I laughed out loud (because I thought a lot of that was funny). I wonder if Tim Cook will wear the Steve Jobs black turtle neck and blue jeans?